Outdoor experiences with The Mountaineers are transformative. We are explorers who seek adventure and challenge. We teach skills and inspire new generations of adventurers, building community and creating lifelong memories. New leaders are forged on windswept ridges and in deep, forested valleys. We come home with a passion to share and a resolution to protect wild places - the places we love. Our outdoor experiences are imbued with commitment and conviction. In short: we adventure with purpose. Each spring we gather our Mountaineers community to celebrate our achievements and support future efforts to transform lives and protect wild places. 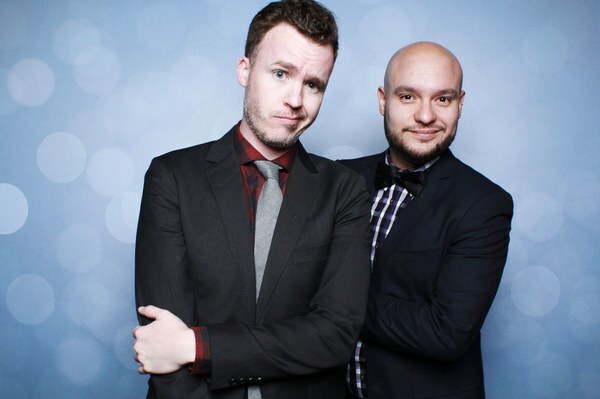 We’re so grateful to those who were able to join us, and to everyone who has supported us throughout the year. 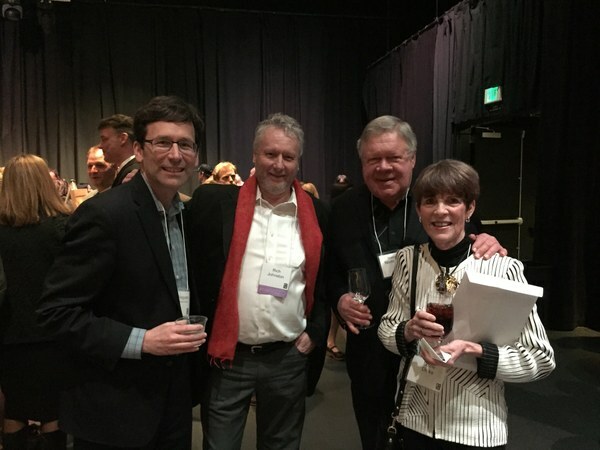 We were honored to have Washington Attorney General Bob Ferguson, Governor Dan Evans, and the Honorable Norm Dicks in attendance. We appreciate our legislators who champion our public lands! 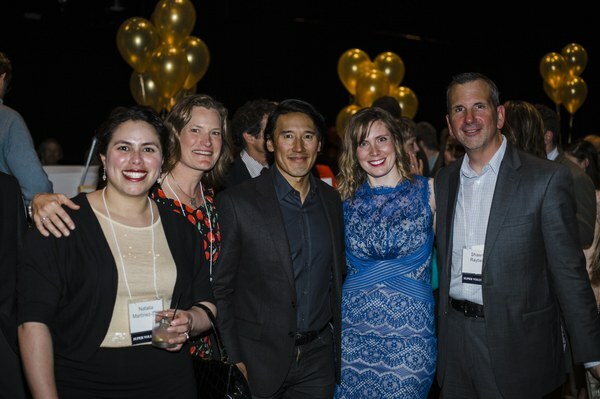 The night started with a special VIP reception with our guest of honor - mountaineer, photographer, filmmaker, and Oscar winner Jimmy Chin. 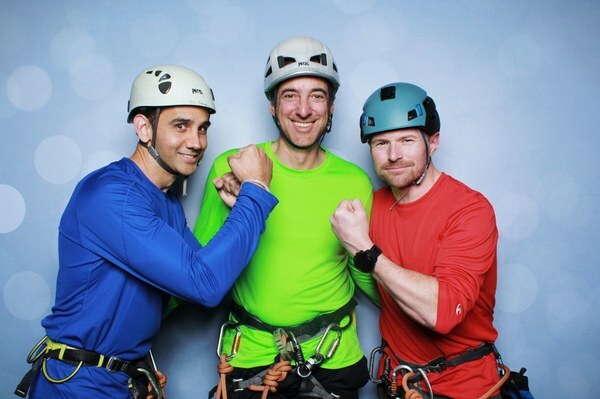 When attendees arrived, they received donation cards to support a favorite race in another nail-biting Tyrolean Traverse, this time in a rematch of last year's dramatic (and contested!) Battle of the Board Presidents. 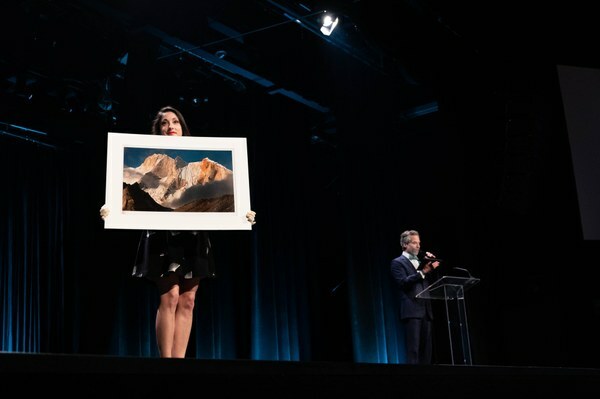 While enjoying dinner, we bid (like maniacs) on an impressive collection of live-auction experiences, including a signed Jimmy Chin print of Meru. 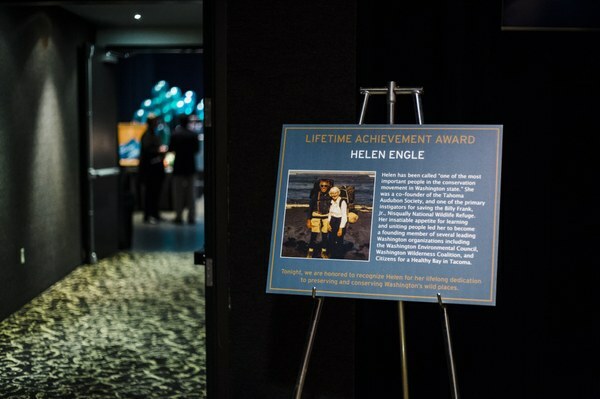 We honored legendary Mountaineer Helen Engle with the lifetime achievement award, presented by prominent environmentalist Martha Kongsgaard, and accepted by three of Helen's seven children. We shared a tender moment with a participant from Young Women Empowered. Jaydalen Blossom took the stage to ask our community to give boldly. And give boldly we did. During the raise the paddle, our community gave more than $140,000! Add that to the funds raised from the rest of the evening, and we raised more than $430,000! 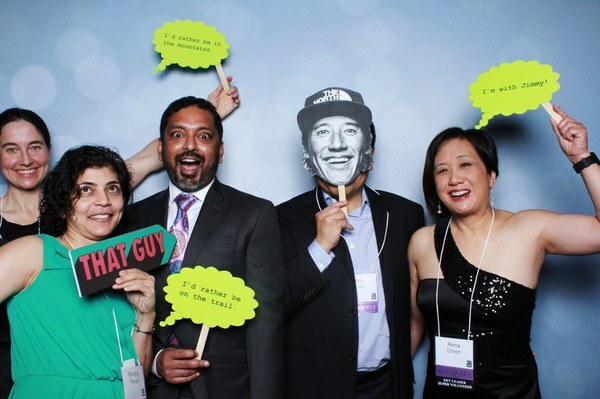 A huge thank you to all of our transformational supporters! The evening wrapped with an incredible presentation by legendary climber Jimmy Chin, introduced by renowned alpinist Steve Swenson. Jimmy shared behind-the-scene stories of his life as a mountaineer, photographer, and Oscar-award winning filmmaker. We are grateful to Jimmy supporting our organization, and we are so thankful for this amazing night with our community. These days, many people don’t have the same opportunities to explore the natural world that most of us had growing up. Our volunteer leaders give their time to change that, and the actions of these individuals have big impacts. When we connect people to the natural world for the first time to experience the thrill of accomplishing something new in the outdoors, they become fierce advocates for our wild places. This is what adventure with purpose is all about. 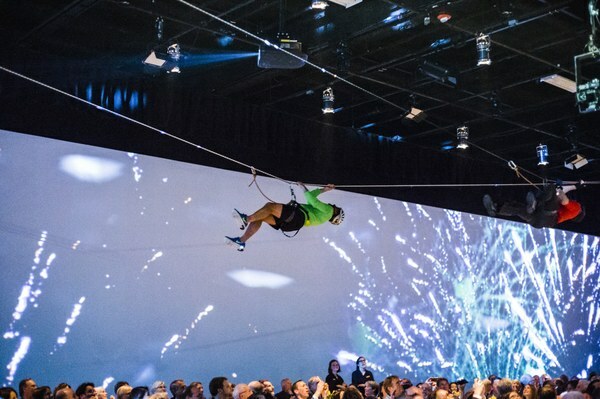 In what has become a Mountaineers staple, we opened the show with another nail-biting Tyrolean Traverse, performed above the heads of our 500 attendees. For the uninitiated, a Tyrolean traverse is used to move between two rock features. Ropes are strung between points on each side of the span, allowing climbers to traverse through the air, attached to the rope via a harness and pulling hand over hand to get from one side to the other. It’s commonly used to negotiate rivers or reach a detached pillar. Or, in our case, to raise funds for three Mountaineers initiatives: Lead Innovation in Outdoor Education, Engage Future Mountaineers, and Advocate for our Wild Places. 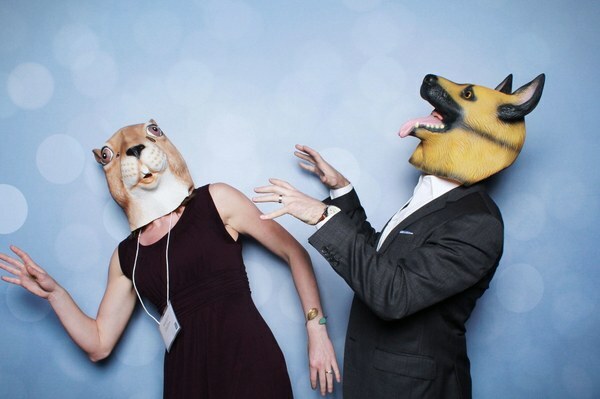 With $25 per donation ticket, we raised an astonishing $24,400 for our programs! For those fortunate enough to witness The Mountaineers 2018 Tyrolean Traverse, you’ll remember a dramatic (and contested!) victory as Board Vice President Vik Sahney triumphed over Board President Emeritus (and crowd favorite) Gavin Woody. Vik and Gavin faced off yet again this year, this time against a third mystery racer, who was revealed only minutes before the race, to determine the ultimate victor. With the surprise announcement, Rich Draves joined Gavin and Vik to charge down the course! All three racers were neck in neck until the end, with Vik determined to maintain a small lead. Gavin and Rich fought hard to close the gap, but were unable to do so, leaving Vik the undisputed winner and repeat champion! 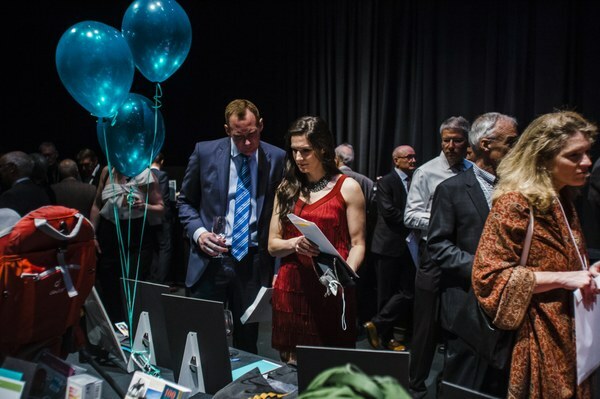 Before the event officially kicked off, we hosted a robust silent auction, with 56 packages available for bidding. 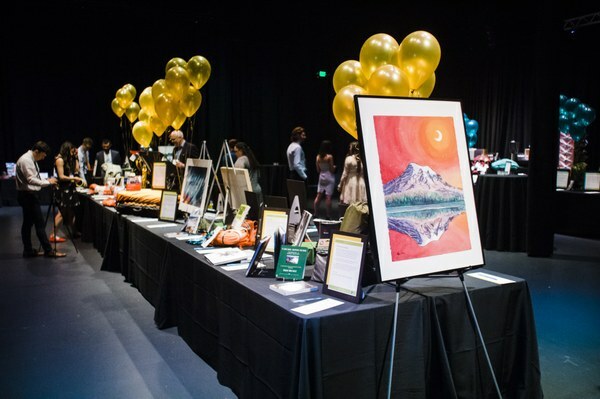 Items included a beautiful custom painting by local artist Nikki Frumkin of Drawn to High Places, top quality gear, books, climbing packages, surfing lessons, a splitboard, and more provided by our incredible partners. 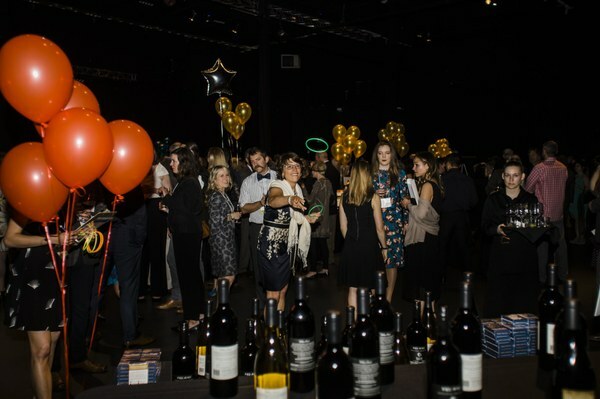 We also had a photo booth, a wine toss from our signature wine sponsor Tinte Cellars, and signature cocktails provided by Heritage Distilling Company. 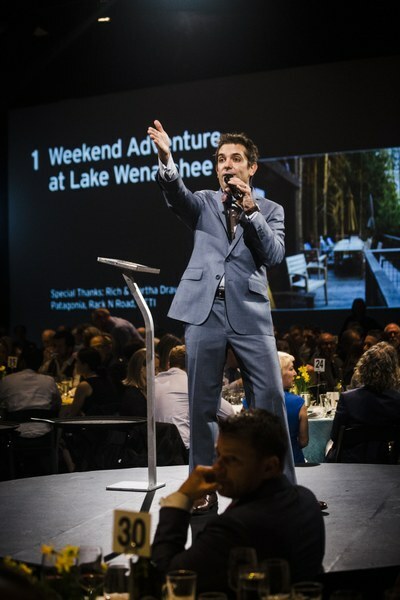 Led by our auctioneer Fred Northup, Jr., and supported by Live Auction Reader Michael Bils, the paddles shot up for our first live auction item - a weekend adventure at Lake Wenatchee at the home of our Event Chairs Rich & Martha Draves. More amazing items followed, 11 in total (you can read all about them on our Auction Preview post), with bid cards flying into the air. Special thanks to Garrett Arnold and Skye Stoury, our "Vannas" for the evening. 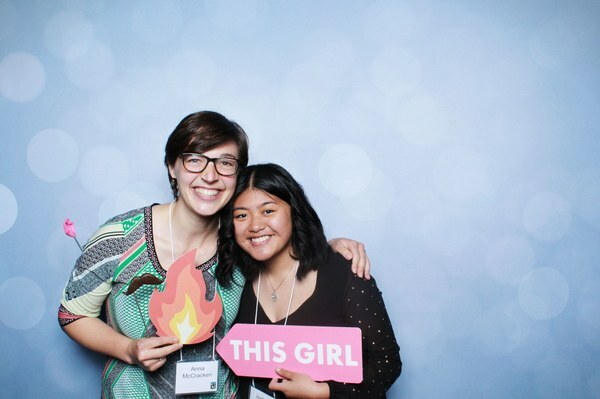 After the live auction, Jaydalen Blossom, a 14-year-old Young Women Empowered (Y-WE) participant, took the stage. Being part of Y-WE's Nature Connections (a partner with our Mountain Workshops program), Jaydalen is one of over 1,000 youth who received recreational outdoor experiences through The Mountaineers in 2018. Even though Jaydalen has only been with the program for less than a year, she has already had many transformative experiences: snowshoeing at Mount Rainier National Park, cross country skiing at Lake Easton State Park, hiking at Dash Point State Park, and camping at Wanapum Recreation Area in Vantage. "I feel so grateful to experience these places. I'm sure you know this feeling, but connecting with nature . . . it really taps into the mind, body, and spirit. When I am outside in these wild places my mind feels at peace and I am able to let go, my body feels rejuvenated and energized, and my spirit is humbled and free." Such experiences, she explained, have allowed her to grow in capability, confidence, and community - they have given her a sense of belonging. Concluding, Jaydalen asked our community to give boldly in support of providing more youth access to wild places. 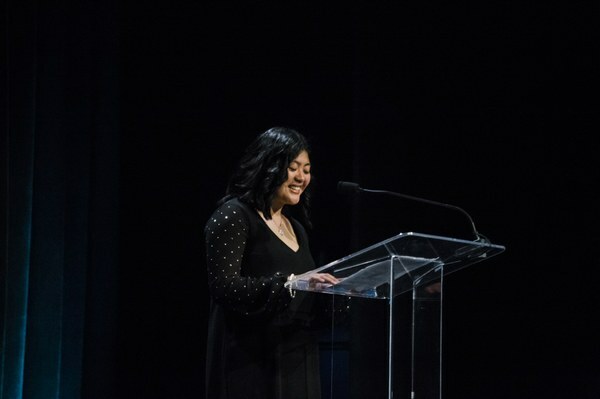 She urged that our futures depend on how we prepare today's young people to be the next generation of great stewards and fierce protectors of the people, places, and experiences that we all hold dear. Give boldly we did. During the raise the paddle, our community gave more than $141,000! Add that to the funds raised from the rest of the evening, and we raised more than $430,000! A huge thank you to all of our supporters! 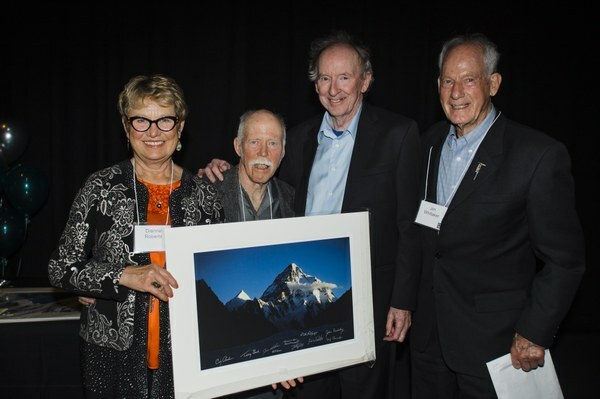 The Mountaineers Lifetime Achievement award is an annual honor given to a member of The Mountaineers community for their lifetime of contributions to the outdoor community. This year we were proud to honor Helen Engle, a Mountaineer, conservationist, community organizer, and beloved wife, mother, and friend. She was a co-founder of the Tahoma Audubon Society, and one of the primary instigators for saving the Billy Frank, Jr., Nisqually National Wildlife Refuge. Her insatiable appetite for learning and uniting people led her to become a founding member of several leading Washington organizations including the Washington Environmental Council, Washington Wilderness Coalition, and Citizens for a Healthy Bay in Tacoma. When Helen joined The Mountaineers in 1952, she was already an active member in the environmental protection movement. A fourth generation Washingtonian, Helen grew her resume to list extensive involvement in conservation causes. She devoted her life to protecting the places she loved and in the process inspired generations of conservationists. Sadly, Helen passed away peacefully surrounded by family at 93 years young just weeks before our gala. You can read more about her incredible life on our Remembrance blog. Helen's award was presented by Martha Kongsgaard. There is perhaps no better person to talk about Helen's environmental achievements because Martha has also been serving the community in many similar ways. 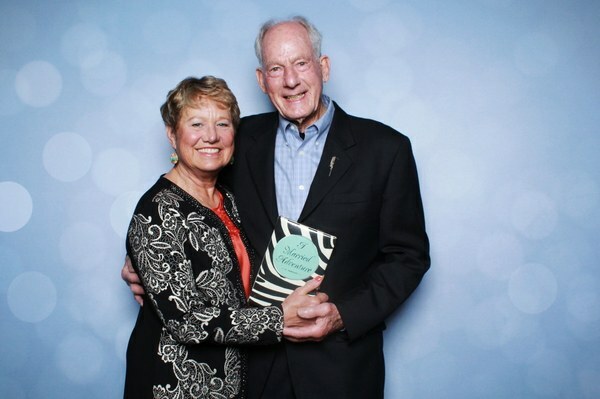 In 1988 Martha and her husband, Peter Goldman, founded the Kongsgaard-Goldman Foundation, which has invested in not-for-profit environmental, social justice, and arts organizations in the Pacific Northwest and Alaska. 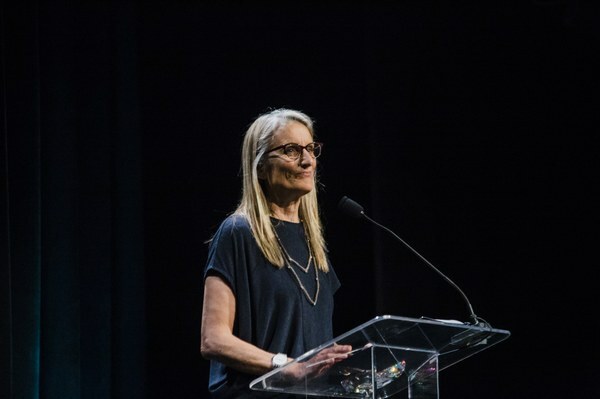 Martha has also served our community in countless ways through a number of leadership roles, and is currently heading up the work to build the new Seattle Aquarium's Ocean Pavilion. 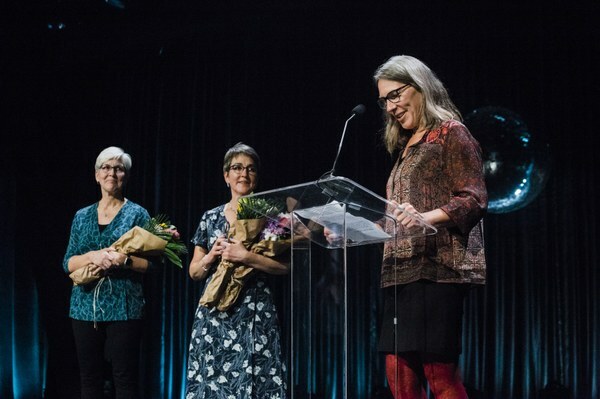 At the conclusion of the video, three of Helen's daughters - Gretchen, Melanie, and Heidi Engle - took to take the stage and accepted the lifetime achievement award on behalf of their mother. Jimmy Chin is a world-renounced mountaineer, alpinist, skier, photographer, and filmmaker. With the recent success of his film Free Solo, he also became an Oscar winner. As a 15-year veteran of The North Face Athlete Team, Jimmy is one of the only people to ski Mount Everest from the summit and climb the first ascent of the Shark's Fin on Meru. 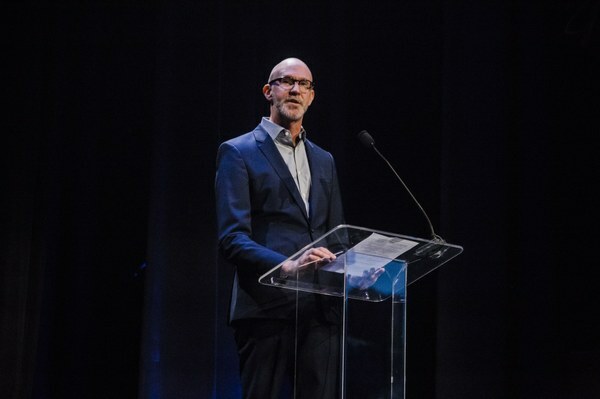 Jimmy has been profiled in numerous publications including National Geographic, The New York Times, Wall Street Journal, GQ, People, and The New Yorker. 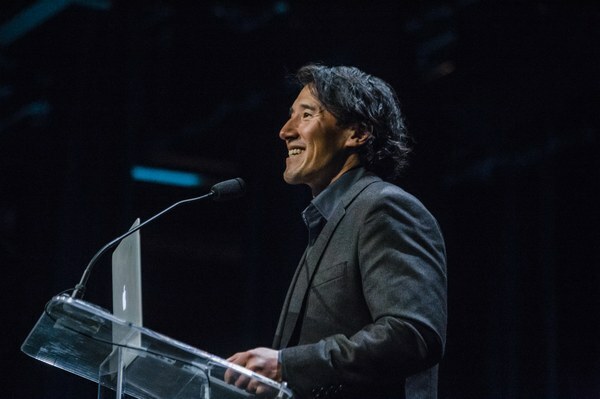 It is a vast understatement to say we were very grateful to have Jimmy Chin as our keynote speaker this year, considering how busy his schedule has been this past year with the success of Free Solo. Jimmy was initially invited to speak at our gala by his longtime friend, Mountaineers Board Member and legendary alpinist, Steve Swenson. Their mutual admiration and support of one another was what made Steve's special introduction of Jimmy so endearing. It was a true celebration of the friendship and community that mountaineering offers to all of us. 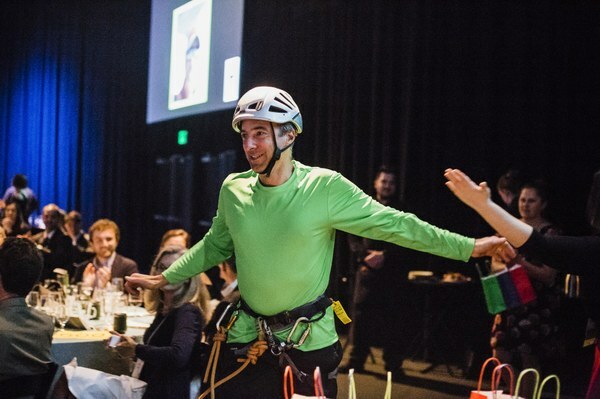 This theme continued through Jimmy's presentation as he recounted his years learning to become a climber in the Yosemite Valley, from the likes of people like Dean Potter, and then going on to summit some of the world's highest peaks, under the mentorship of leaders like Conrad Anker. The theme of community kept resurfacing, and stood resolute as Jimmy then concluded his presentation by discussing his friendship with Alex Honnold, what the process was like in filming his epic free soloing feat, and recounting a few funny stories that happened behind-the-scenes (like losing, but ultimately retrieving, their buddy's cat). The speech was yet another clear reminder to us all of what it means to adventure with purpose. Throughout our history, volunteerism has been at the core of The Mountaineers. 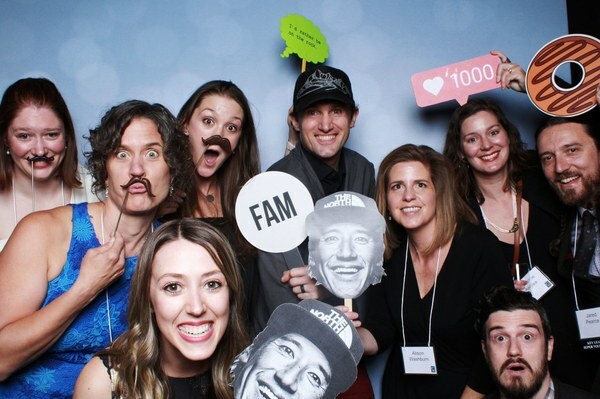 Volunteers make it possible for us to carry on our legacy of outdoor education, integrity, and action. But we couldn’t have nearly the depth of impact without you and your amazing generosity. When you’re on a hike and you encounter others high in the alpine - feel proud knowing that the 10 Essentials has significantly increased their ability to make it home safely. When you read Freedom of the Hills, feel proud that generations of Mountaineers volunteers have shared their collective wisdom of mountain craft, for the benefit of people around the globe. When you wake up to crystal-clear skies as the sun rises over the jagged peaks of the North Cascades or the Alpine Lakes Wilderness - feel proud knowing that you helped to pass the legislation that protects them. When you hear the laughter of kids cooking a meal on a backcountry stove or practicing first aid, feel proud that you’ve helped them learn a lifelong outdoor skill. When you look at Tahoma and think of all the climbers who’ve been daring enough to summit her - feel proud knowing that the safety of routes were informed by the expertise of our members, whose guidebooks are integral to their success. We are truly grateful for the generosity of this community - your time, your knowledge, your passion and your donations. Each of you plays an important role in making the mission of The Mountaineers a reality and we thank you for supporting our work. And thank you, once again, for making this fun party one to remember! 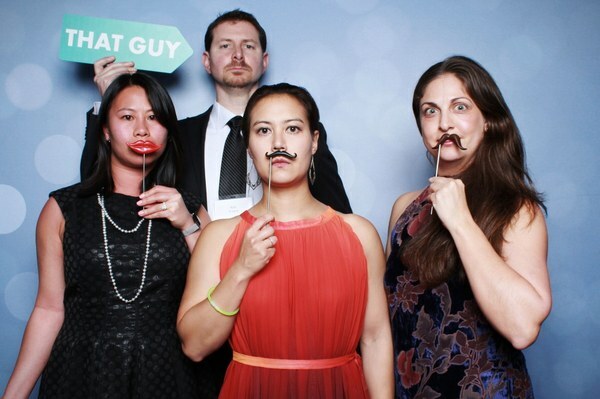 View ALL OF OUR PHOTOBOOTH PHOTOS. 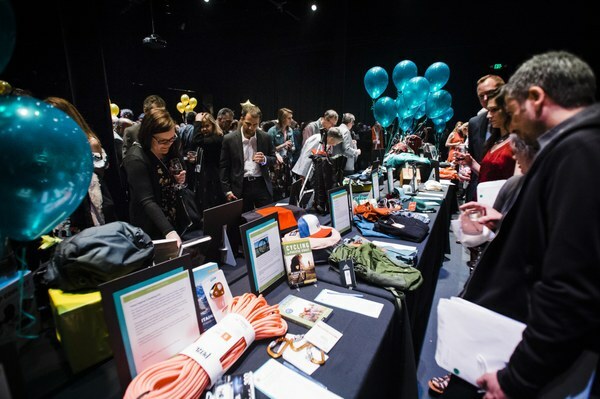 We want to extend a huge thanks to all of our generous supporters, including: The North Face, REI Co-op, Hydro Flask - Parks for All, United, Brown & Brown, Global Strategy Group, Helly Hansen, Waypoint Outdoor, Wells Fargo, Vertical World, MSR, Therm-a-Rest, Heritage Distilling Company, Tinte Cellars, Deschutes Brewery, Ghostfish Brewing Company, Lagunitas Brewing Company, and Redhook Brewery. 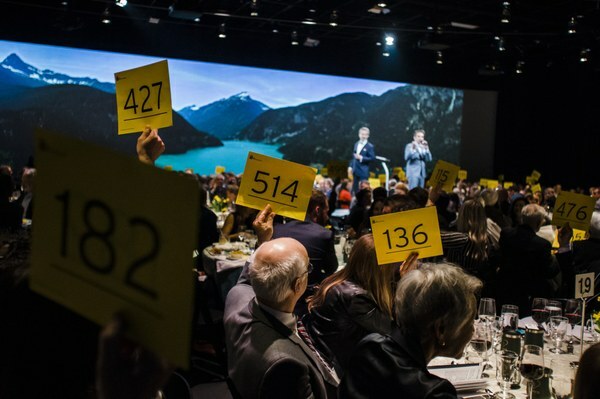 Our live and silent auction would not have been possible without in-kind product support from Alaska Airlines, American Alpine Institute, Anthony's Restaurant, Arc'teryx, Arc'teryx Seattle Store, Arrowleaf Bistro, Tami Asars, Balloons Above the Valley, Banff Park Lodge, Banya 5, Baywater Shellfish, Big Agnes, BioLite, Black Diamond Equipment, Ltd, Caffe Ladro, Cascade Bicycle Club, Cascade Designs, Chardonnay Golf Club, Chihuly Garden and Glass, Lorna Corrigan & Ken Christiansen, Lisa Corrigan & Rick Nelson, Maria Coryell-Martin, Crown Bees, Deschutes Brewery, Deuter, Discover Scuba Diving, Drawn to High Places, Rich & Martha Draves, Tyler Dunning, Susan Elderkin, evo, Feathered Friends, Fremont Brewing, Fremont Studios, Garmin, Mike Gauthier, Ghostfish Brewing Company, Goat’s Beard, Mountain Supplies, Glazer’s Camera, Gregory Mountain Products, Jordan Hanssen, Helly Hansen, Bill Hecker & Joy Parobek, Heritage Distilling Company, Hex Climbing, LLC, Hydro Flask - Parks For All, Jackson Hole Mountain Guides, Jimmy Chin Productions, Jones Snowboards, Julbo, Kaspars Catering, Martha Kongsgaard & Peter Goldman, Brynne Koscianski, Lagunitas Brewing Company, Madison Mountaineering, Garrett Madison, Mammut, Noriko Marshall Landscape Architecture, Maria Hines Restaurants, Steve McClure, Elly Minagawa, Mt. Spokane Ski & Snowboard Park, MSR, Craig Muderlak, Museum of Flight, Museum of Popular Culture, Nordic Museum, North Cascades Mountain Guides, Ombraz, Sam Ortiz, Ortlieb, Outdoor Research, Parks Project, Patagonia Seattle Store, Patterson Cellars, Petzl, Bryce & Elise Phillips, Rab, Rack N Road, Cathy & Alec Ramsay, REI Co-op, Rheos, Craig Romano, John Rudolf, Sail Sand Point, Salmon Sisters, Gail Sanderson, Sea to Summit, Sealskinz, Seattle Bouldering Project, Seattle Symphony, Ron & Eva Sher, Sherpa Adventure Gear, Skratch Labs, Smartwool, Snow King Resort, Paul Souders, Spy Optic, Stanley PMI, Summit Workshops, Surf Ballard, Steve Swenson & Ann Dalton, The North Face, The Wandering Goose, Therm-a-Rest, Tinte Cellars, Sherrie Trecker, TSUGA Fine Art & Framing, Bill Thorness, Nicole Tsong, United Airlines, Urban Float, Vertical World, Vibram, Tom Vogl, Martin Volken, Waypoint Outdoor, Jim Whittaker & Dianne Roberts, Wine Road, and YETI.